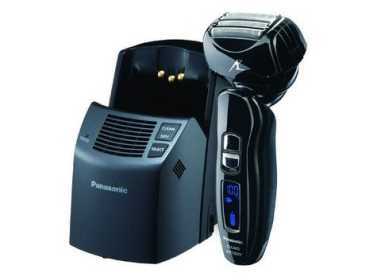 The Panasonic ES-LA93-K Arc 4 has been around for quite some time now and it gained a reputation for being a highly capable electric shaver. Moreover, its price has dropped significantly in the last few years and now offers excellent value for money. And at least according to the specs sheet, it comes packed with features and technologies that will supposedly give you one of closest shaves of any electric shaver. Let’s find out if that’s really the case as we take a closer look at this shaver in our Panasonic ES-LA93-k review. Wrapup. Who should buy it? When going over the list of features it’s very likely that you’ll be impressed. Even though some of them are common to other Panasonic shavers (like the 30 degrees nano blades), it does have quite a few that were first introduced with this model. Basically, this is Panasonic’s terminology for a shaving head that can pivot in four directions: back and forth and left to right. This should improve the way it follows the contours of your face, especially in tricky areas like the chin and jawline. You also have the option of locking the head in a fixed position with a switch located on the back of the shaving head. This can be useful for certain areas where you need more precision, for example when shaving right below your nose. Previous and less expensive Panasonic models had a mechanism that only allowed a left to right swivel of the shaving head. The ES-LA93-K has a 4-blade shaving system with an arched profile (hence the ARC 4 name) and all four blades can move independently. There are two main foils (the outermost ones), one slit foil for cutting long hairs and one extra thin finishing foil. The blades and foils are made of hypo-allergenic stainless steel in order to minimize irritation. Even though the previous Panasonic models had pretty impressive motors with 13 000 CPM (cycles per minute), this one goes one step further. It is one of the most powerful motors you can find on any shaver and this really gives it the extra edge when it comes to fast shaving times and cutting coarse facial hair (more on that in the performance section of the review). 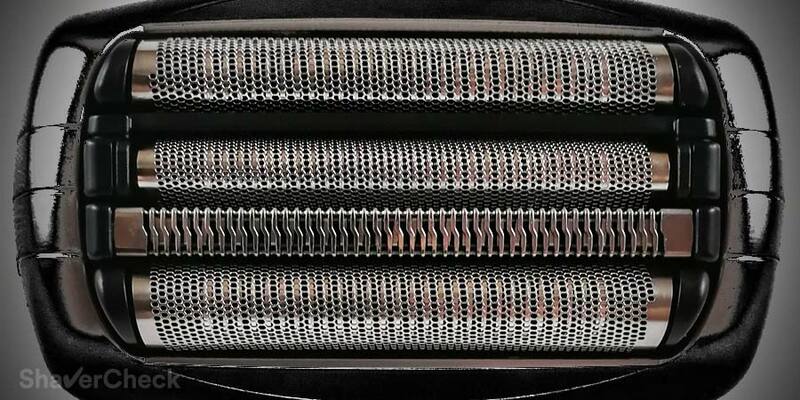 The ES-LA93-K has a second motor located in the shaving head itself with the sole purpose of producing vibrations of the outer foil (similar to Braun’s Pulsonic technology). This (in theory) lifts the hairs that lie flat on the surface of the skin, making it easier for the blades to capture and cut them. It should also reduce the amount of pressure needed when shaving, causing less irritation and razor burn. 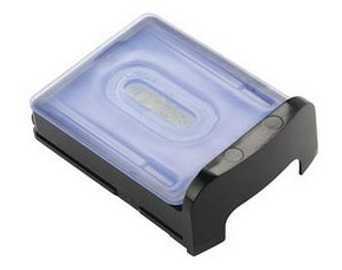 The Vortex Cleaning System that comes with the ES-LA93-K acts as an all-in-one cleaning and charging dock. The station cleans, lubricates, dries and also charges the shaver. It is the standard alcohol-free, detergent-based cleaning solution that Panasonic uses and in my opinion it works quite well and with pretty reasonable costs of ownership. Right out of the box, the Panasonic ES-LA93-K really stands out with its piano black glossy finish. It looks more striking than its other identical sibling, the silver ES-LA63-S. The fit and finish are very nice and the blue backlight of the LCD display adds to the classy and quality feel. Holding the shaver in hand feels natural and comfortable and has a nice, reassuring weight that is very pleasant. The ES-LA93-K surely got the looks and it stands out compared for example to the understated, even boring design of a Braun Series 7. The shaving head is quite massive with the 4 cutting elements, but once you get used to its size you’ll have no issues shaving with it. The fact that it’s not top-heavy definitely helps as well. 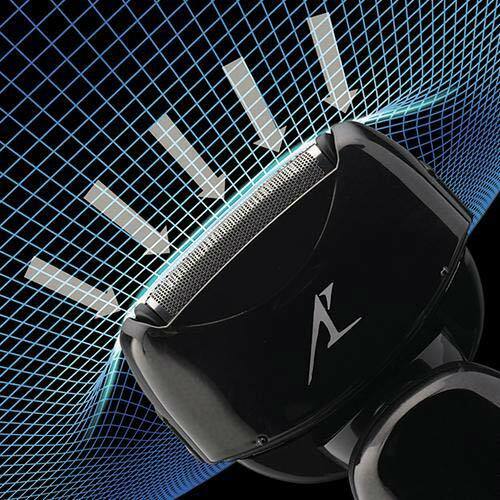 The sides and back of the razor are covered in a very grippy rubber-like material and the body of the shaver tapers and it features an ergonomic profile, all of these ensuring a secure and comfortable grip. With a fully charged battery, the ES-LA9-K should last for 45 minutes of use. Charging it from 0 to 100% takes approximately 60 minutes. This shaver has a Li-ion battery that can’t be overcharged, so it’s safe to leave it in the cleaning station even after it is fully charged. Doing so will make the bright blue display blink constantly, which can be annoying in a dark room. You also get a charging cord, so you can plug it directly into a power outlet. This is a great solution for traveling as you don’t have to carry the bulky cleaning & charging station with you. However, you cannot use the shaver while it is charging. This is a common safety precaution with all wet/dry electric shavers. The ES-LA9-K has an Automatic Voltage Converter, so you can charge it anywhere in the world. The LED display has a 10 stage battery indicator and will also show you how long your shaving session took, the charging status and when it’s time to clean it. You basically have two options for cleaning this shaver: manual and automatic. As it’s the case with all the foil shavers that are fully washable, you can simply clean it with warm tap water. For better results, it’s a good idea to apply some liquid hand soap on the outer foil and then activate the cleaning mode. The ES-LA93-K has a Sonic Cleaning Mode that can be enabled by pressing and holding the ON/OFF button for two seconds. Once it enters this mode you’ll notice a higher pitched sound of the motor and a special indicator on the LCD display. The inner blades will oscillate extremely fast, dislodging hardened grime and also preventing splashes. After 20 seconds it will automatically turn off. After that, you simply remove the foil frame and rinse it under running water, along with the inner blades and the rest of the shaver. Shake off the excess water and let the parts air dry before storing your razor in a cabinet. Panasonic shavers are usually very easy to clean manually and that’s the case with the ES-LA93-S as well. If for some reason you don’t want to use the station, cleaning it manually is a breeze and takes very little of your time. The use of liquid soap will however remove any lubricants from the blades, so it would be highly recommended to do it regularly if you don’t use the station. Clipper oil, sewing machine oil or a spray lubricant will work just fine. Here‘s how and when to do it. 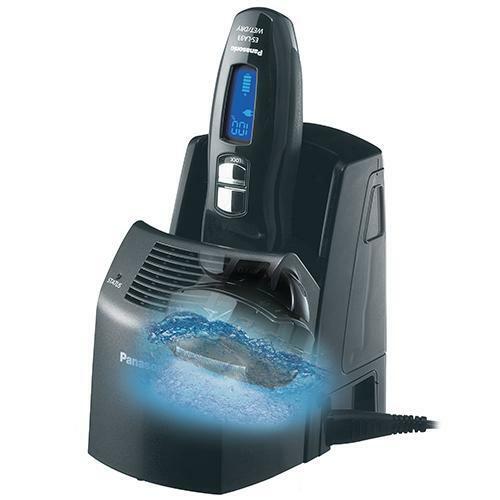 The shaver includes the so-called Vortex Cleaning System, the name used by Panasonic for some if its older generation automatic cleaning stations. Cleaning the ES-LA93-K with the station is dead easy: you fill up the water container and insert a cleaning cartridge in the station. After that, you simply put the shaver in place and select one of the two available options: cleaning or drying the shaver. This will also automatically charge it. The water in the container needs to be changed only when you replace the cartridge with a new one. The costs of using the cleaning station are quite low. The cartridges are inexpensive, particularly when compared to Braun’s OEM cleaning cartridges that also need to be replaced more often. The station works really well and cleans the shaver thoroughly of any hair clippings and dirt. The solution also lubricates the blades so you won’t have to do it yourself. The cleaning cycle takes around 10 minutes. During this time the shaver is turned on and the cleaning fluid is flushed repeatedly through the shaving head. Once the cleaning is done, the drying takes between one and 3 hours and is carried out by a fan. It’s not the quietest out there, but it’s not too bad. A single cartridge will last for at least 30 cleanings, so if you shave once every two days a pack of 3 should be enough for 6 months. In practice, you’ll replace a cartridge every two to three months. As for the downsides, the station is bulky and will take a lot of room on your countertop. Some users have also reported leaking of the cleaning fluid. Overall, it is a convenient cleaning station that works quite well, but as I said previously, it’s not absolutely necessary as the shaver is dead easy to clean manually. So in case you want to save some money you can opt for the Panasonic ES-LA63-S variation that doesn’t include a cleaning base. So far the ES-LA93-K Arc 4 managed to impress with its looks and features list, but it all comes down to how good it performs. I’m pleased to say that it meets all the expectations, providing an overall great shaving experience: smooth, comfortable, very close and very fast. You won’t suffer from any pulling or tugging mainly thanks to its very powerful motor and sharp blades. In my opinion Panasonic is right at the top in this regard. 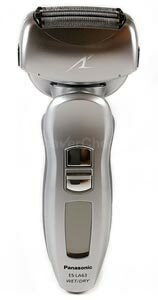 Also, it seems to require less pressure than other shavers in order to get a close shave. And that is always a good thing, as irritation and razor burn are often caused by excessive pressure and multiple passes. Of course, there can be situations where you’ll need to insist more on difficult areas (like the neck), but that’s the case with all electric shavers when dealing with wiry, flat-lying hairs. Using it for both dry and wet shaving will get you great results, so it’s only a matter of personal preference and time constraints. In my case, the wet shave was noticeably more comfortable compared to using it dry, but I do have very sensitive skin, so your results may be different. Also, you’ll be pleased to know that the time needed for a complete shave is shorter compared to other razors from the competition. However, this is mainly true in the case of shorter facial hair (two to three days at most). Like all Panasonic shavers, the ES-LA83-K isn’t quite the best when dealing with wiry, flat hairs. If you’ll be using it daily or every two days you won’t have any problems in that regard. After that you can just put it in the cleaning station and you’re all set. As a conclusion, I guess it’s safe to say that it shaves as good as it looks. Panasonic recommends changing the foil and inner blades once a year, but many users have found that they can last even longer. It also depends on how often you use the shaver and how coarse your beard is. You can buy the parts separately or as a combo. Buying the parts as a set is usually the most economical option. The Panasonic ES-LA93-K Arc 4 is without a doubt one of the best shavers out there for the money. There is little not to like about it. I guess I can say that using the Cleaning Station takes some time and it may seem noisy to some. And that the blinking of the LED display may be annoying. But these are minor drawbacks compared to the benefits of a very close and (generally) comfortable shave. Also, if you have very sensitive skin, suffer from razor bumps or ingrown hairs, a Braun Series 5 or 7 may be a better choice, especially if you plan to shave dry. 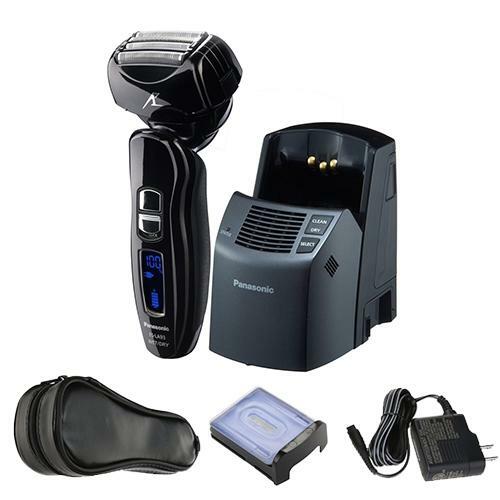 The Panasonic ES-LA93-K would be a great choice for men with high expectations from an electric shaver, especially with regards to closeness. It works great for coarse and fine hair or for shaving your head. Finally, if you need fast and close shaves this one will get the job done without any problems. This pretty much wraps our review of the Panasonic ES-LA93-K Arc 4. Let’s now check out some alternatives. Even though the initial price was very high, you can now find the ES-LA93-K for even half that price. Given the fact that you’re getting a great shaver, I’d say that it offers very good value for money. An obvious choice for a different shaver would be the Panasonic ES-LA63-S that I’ve mentioned a couple of times throughout this review. It’s basically an identical product, but without the cleaning and charging station. And it’s only available in silver. So for anyone looking for basically the same shaving experience, but doesn’t need the cleaning station, this is a great alternative. And it costs less, so you’ll also be saving some money. Finally, the Braun Series 7 is a good alternative for men with very sensitive skin. Because it shaves very close, the ES-LA93-K can be a bit too aggressive for some. A Braun Series 7 is more gentle to the skin and more comfortable out of the box. The 790cc and 7865cc are both equally good options. While you can use the 7865cc with your favorite shaving cream, this doesn’t improve the results as much as in the case of Panasonic shavers. The Series 7 is however really comfortable during a dry shave and while it won’t shave as close as the ES-LA93-K, it would arguably be a better option for users with very sensitive skin. The Series 7 is also better with long, flat hairs, so if you shave less often, the 7865cc would again be a better pick. my cleaning station for my arc 4 es- la93 no longer circulates fluid on the head. any thoughts on fixing this or should I stay with manual cleaning? should I go for another la93 or an lv95? Unfortunately I am not qualified to offer you any advice regarding the servicing of the cleaning station. Your best option would be to contact an authorized Panasonic service center, but that can end up being pricey since I imagine your warranty has expired. Cleaning it manually is actually very easy, I rarely use the stations that came with some of my Panasonics. If your shaver still works great and you don’t mind spending a minute or so to clean it, I don’t really see the need to upgrade. The ES-LV95-S has one extra blade and a redesigned, more compact cleaning station. It’s not a huge performance bump compared to the Arc 4 line, particularly the ES-LA93-K and the ES-LA63-S, but I do find it to be more comfortable. There is a video on YouTube on repairing a similar Vortex cleaning station – so theoretically you may be able to fix it yourself – although the one on the video is put together differently than this one. I just purchased the ES-LA93-K Arc4 with the old vortex cleaning system. So far i really like it but am wondering if I’d benefit from exchanging it for either the first generation Arc5 with the vortex system or the second generation Arc5 with the new cleaning system? I can get the first gen Arc5 right now for about $140 USD (same as what i paid for the Arc4) or the second gen Arc5 is about $60 more. Best i can tell Id be trading the second vibrating head motor in the Arc4 for an extra blade in the Arc5? Which provides more benefit? I really want the cleaning station with it, if for nothing else, to have a convenient place to charge and dry the shaver. I was pleasantly surprised to find out that the vortex station has a fan and a small heating element that both help with drying. Do you know if the new cleaning station has both? Right now, I’m leaning towards keeping the Arc4 or getting the first gen Arc5 and swapping out the foil with the newest Arc5 foil with the comfort rollers down the line but interested in your thoughts. Thanks! Given the fact that you are satisfied with the performance of your ES-LA93-K my first suggestion would be to keep it. However, the other options are also appealing in this particular situation, mostly because of the deals you can get on the other shavers. I personally didn’t notice any major benefits from the second vibrating motor fitted to the ES-LA93-K/ES-LA63-S. I have other Arc 4 shavers that lack this feature and I honestly didn’t see a major improvement. Yes, I do shave every other day so my bead is pretty short, but I still wouldn’t consider it a must have feature. The Arc 5 has one extra blade and that’s pretty overkill, but the overall size of the head is not a whole lot bigger compared to the ES-LA93-K and I think you’ll feel right at home with it coming from an Arc 4. It could be just placebo, but I do get a slightly closer and faster shave with an Arc 5, be it first or second gen.
As far as I know, the newer cleaning stations from Panasonic like the one included with the ES-LV95-S don’t have the heating element and only use a fan to dry the shaving head. The new shaving head (foils+inner blades) of the latest Arc 5 is still obscenely expensive, but the price will likely go down as time passes. The fact that you can use it with the first gen Arc 5 is also a plus. All things considered, I think that I would actually opt for a first gen Arc 5 if I could get it for the same price as the ES-LA93-K. But that’s really up to you, these are simply the reasons why I would do it. Thanks, very helpful advice! Btw your reviews and comparisons are great! 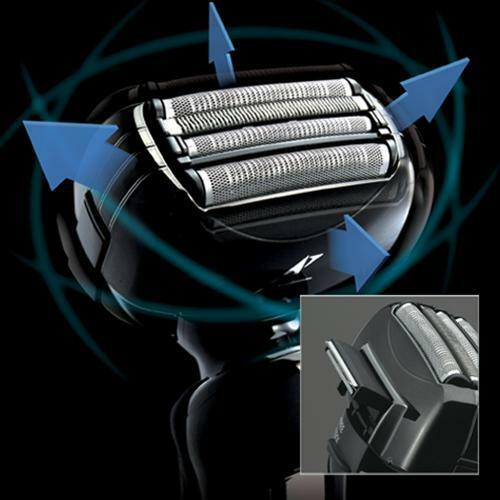 I have a ES-LA63 shaver and just a few days ago, an icon on the screen that shows the shaver head surrounded by a circle formed by 2 180° arrows. Can you inform me about what the shaver is indicating? Please advise. Thanks. That’s the indicator that signals when to replace the foils and, if necessary, the inner blades. It usually appears once a year, but it depends on how often you use your shaver. You can reset it by pressing and holding the ON/OFF button for 30 seconds. Also, you should replace the foils/blades when the shaver is not performing as it should, so you can ignore the indicator if that’s not the case with your shaver. for 8 years. Works great. Thank you for your comment, Mike. That’s awesome! 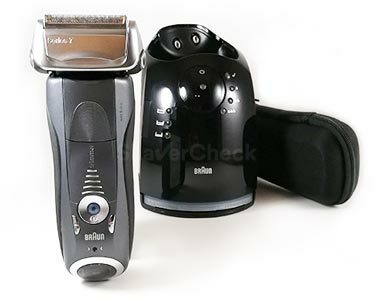 Enjoy your Arc 4, it’s really a great and underrated shaver.